Still lots of blue in that table. But this was at least a day in which things did not appear to get any worse for John McCain. 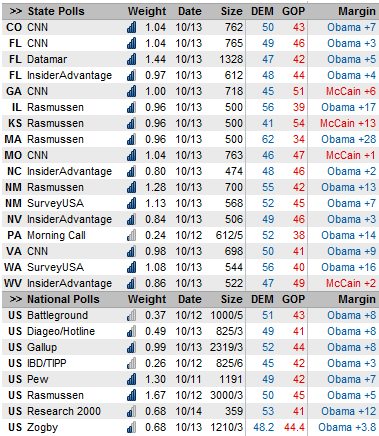 McCain improved his position in three of the seven tracking polls; Obama gained in one, and the other three were flat. In most of the state polling -- like the set of CNN polls for instance -- the trends were basically flat from the last time in the polls were in the field. That's certainly better for McCain than Obama continuing to gain ground. (By the way, we use the version of the CNN polling with third-party candidates included, which is why our numbers may differ from other sources). Meanwhile, our model is starting to make some decisions about just where it thinks Obama's momentum is manifesting itself. Specifically, it thinks that he's gained the most in states with lots of white, working class Clinton voters -- a result which might be intuited by the huge numbers that he's posting in Pennsylvania, or the fact that there's now another West Virginia poll out that shows the race nearly tied. As a result, we're now coloring West Virginia white (toss-up) rather than pink (lean McCain). The model also thinks that Arkansas could be quite interesting the next time that it gets polled. The flip side is that Obama doesn't seem to have quite as much momentum in the Western half of the country, where Clinton generally performed poorly during the primaries.